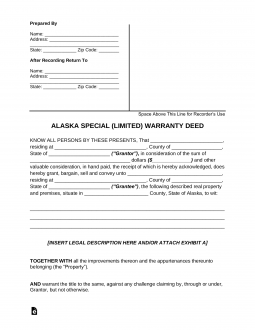 The Alaska special warranty deed is used to convey a parcel of real estate in Alaska to a purchaser with a limited warranty other than specified in the document. The seller must state any restrictions on the warranty in the deed. It is important that the seller’s husband or wife, if married sign the deed as well to make sure that any interest he or she owns is also conveyed. Such interest may be a homestead interest or a joint interest. Once the document is signed in front of a notary, the seller should make a copy for his or her records and provide the original to the purchaser or grantee. Step 1 – In the first two blanks, fill in the name and street address of the grantor(s). Step 2 – Check the box indicating marital status of the grantors. Step 3 – In the space provided, enter the purchase amount. Step 4 – Write in the name of the grantee(s) or purchaser(s). Step 5 – Then fill in their street address. Step 6 – Check the box indicating how the property is going to be held by grantees. Step 7 – In the space indicated, enter the address of the property being conveyed. Step 8 – In the next section, specify the deed recording information. Step 9 – The legal description of the property comes next. This can usually be found on the previous deed. Step 10 – If there are any encumbrances or restrictions that run with the land, put that in next. Step 11 – Enter the recording information of the previous deed. Step 12 – The grantors and grantees should sign and date in front of a notary. Step 13 – The grantor should keep a copy and provide the original to the grantee for recording.